Joel Le Blanc is a professional writer for various websites. Le Blanc is currently a student at the University of Canterbury, where he studies English literature, folklore and creative writing. He holds a Diploma in Herbal Medicine and has studied massage, nutrition, bach flowers and reiki. Black pepper is one of the most popular spices used around the world, and is added to a wide range of foods to enhance flavour and bolster digestion. Piperine, the active principle of black pepper, has a range of health benefits when taken internally, from supporting circulation, reducing inflammation to stimulate digestive juices and enzymes. Crack or grind whole peppercorns onto your meal for best results and to ensure freshness. Herbal remedies are not intended to replace medical care, so consult with your physician before using black pepper as a herbal supplement. If you suffer from a case of acute diarrhea, black pepper is a traditional remedy used in India and Africa as an anti-diarrheal agent. In a study published in "Planta Medica" in 2001, researchers from Panjab University in India investigated the traditional use of black pepper in treating diarrhoea. Mice were induced with diarrhea using products such as castor oil and arachadonic acid. When given black pepper as well, researchers noticed the mice had significantly less diarrhea. While this study supports the folk use of black pepper for digestive complaints, more clinical research on human subjects is still needed. 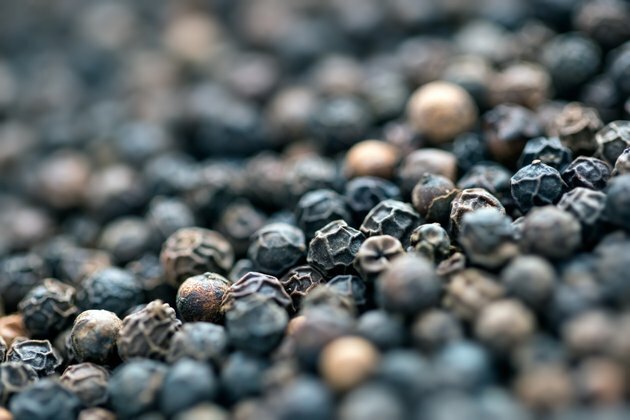 If tests reveal that your stomach acid levels are low, possibly resulting in poor breaking down and absorption of nutrients, black pepper may be able to stimulate an increased production of gastric acid. In a study published in "The African Journal of Medicine and Medical Sciences" in 2002, researchers from the University of Port Harcourt investigated the effects of piperine on gastric acid secretion in rats. Piperine had a significant effect on gastric acid, increasing levels of secretion by up to 22 percent. Eating black pepper with a meal may increase your bodies ability to break down and digest food, but if you suffer from acid reflux or a peptic ulcer, use black pepper with caution. Black pepper increases the absorption of nutrients, plant chemicals and medications when you take it internally. In a review of research published in "Critical Reviews of Food Science and Nutrition" in 2007, black pepper was found to significantly increase the absorption of nutrients and drugs through the intestinal tract. Researchers conclude black pepper likely alters the permeability of the intestinal wall, while slowing down gut motility and stimulating intestinal enzymes. Take black pepper regularly with meals to improve absorption of vitamins, minerals and phytonutrients, but be cautious when taking medications. Black pepper effects the blood levels of a number of drugs, and should be taken away from medications. In a study published in "Die Nahrung" in 2000, researchers from the Central Food Technological Research Institute in India wanted to explore the effect of dietary spices on enzyme secretion. Rats given piperine, the active principle of black pepper, showed an improved secretion of amylase, lipase and trypsin from the pancreas. Increasing the production of these digestive enzymes may support the digestion and breakdown of fats, carbohydrates and proteins in the body. Researchers concluded that black pepper, along with a number of other spices, is a useful digestive stimulant with a positive effect on pancreatic digestive enzymes. Black pepper is considered safe and well-tolerated by the majority of the population. In some individuals black pepper may irritate the mucous membranes of the respiratory or the digestive tract, but it is rarely allergenic. If you experience any digestive discomfort after eating black pepper, discontinue usage. If you are on prescription medications, consult with your doctor make sure it is OK for you to eat black pepper. What Are Health Benefits of Eating Black Pepper? What Are the Benefits of Spanish Black Radish? Why Does Black Pepper Give Me Indigestion?